This is a guest post by Helen Cartwright. Helen is a passionate blogger, who excels in the Digital Marketing and Technology niche. Growing your business and attracting the right prospects is not always a simple or straightforward process. If you’d like to overcome those challenges and boost your bottom line to new heights, you won’t want to miss out on the advantages of inbound marketing. 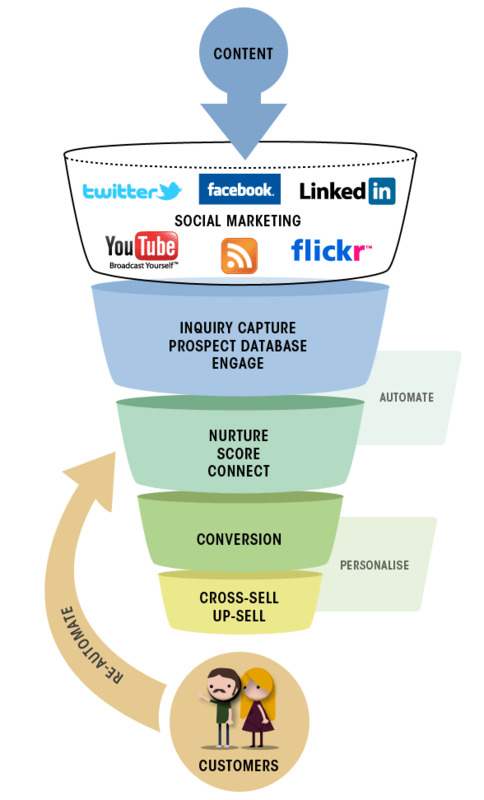 Inbound marketing has helped businesses grow in several niches. The benefit of having stable inbound marketing is that it does not force your visitor to purchase your product or service. Rather, it builds the needed trust in the eyes of your visitors and hence, increases the conversion rate in an organic manner. The goal of any inbound marketing campaign is to increase brand awareness and to get your prospects to come to you. Although it is a long-term process, you can achieve some results in no time once you understand the basics. Approaches like adding calls-to-action across your website, producing your own active blogs can provide quick results to your inbound marketing campaigns. According to Hubspot’s Ultimate List of Marketing Statistics 2017, YouTube is one of the trending platforms to share your content on. If you want to harness the power of inbound marketing but don’t know how to begin, the following tips will help. Setting short and long-term goals is an important piece of the puzzle for anyone who wants to use inbound marketing to grow a business. Whether you would like to generate leads or increase your sales, having solid goals will help you reach your intended outcome. You could feel tempted to keep your goals in your head, but that approach can only take you so far. If you want to get the most from your effort, writing your goals down on paper is an important step that you can’t afford to overlook. You can enhance your effectiveness by placing your list of goals in a visible location, which will allow you to keep your motivation alive. Once you know what you want to achieve, do some research to determine the steps that you will need to take next. Here are some of the more effective ones. As far as inbound marketing is concerned, social media is a powerful tool that will allow you to communicate with your prospects and invite them to engage with your content. You can post helpful tips and guides related to the products that you sell when you want to inspire people to share your content. Also, asking questions will encourage people to comment on your posts and to share them with their friends and family. After you run your page for a while and monitor your results, you will notice that posting at certain times of the day will improve your odds of getting your desired outcome. Facebook allows you to schedule your posts so that you can publish your content at the right time, and you will feel amazed when you see the impact that it can have on your bottom line. Search Engine Optimization, or SEO, is a vital part of inbound marketing that will enable you to attract tons of targeted visitors to your blog or sales page. You can set things in motion by doing keyword research to learn about the terms and phrases that your customers use when they look for the products or services that you sell. – Understanding your website and analyzing your competitors. – Researching and understanding your target audience. – Identifying the search terms that are in use. – Refering to the suggestions that you might get while searching for that keyword. With your list of keywords on hand, you will then create content that answers questions and provides value to your readers. If you don’t know what you should write, think of the things that people will want to know when they search for your targeted keyword on the search engines. Building backlinks to your content will help improve your SEO rank and get your content to the top of the search results page, and search engine optimization will provide you with a flow of targeted visitors for years to come if you don’t try to cheat the system. When you want to boost your inbound marketing results to the next level, you will want to produce content on several platforms. Rather than just reading articles, some people like to watch videos when they want to learn about certain topics, and you can take advantage of that trend. Create YouTube videos that answer pressing questions that your prospects have, and you will know that you have done the right thing when you see the outcome of your dedication. When you want your video to show up on the first page of Google and other search engines, use your targeted keyword in the title of your video. You can use the tools that YouTube offers to see how long your audience watches each video that you post. If most people stop watching at a certain point, you can identify your mistake and make improvements to reduce your bounce rate. Since you are not the only person to use inbound marketing to attract the right audience, you will need a way to stand out from the herd if you don’t want to fall behind. Even though many people want to grow their businesses, a lot of them will publish low-quality articles and videos, wasting their time in the process. If you focus on offering quality content at all times, you will captivate your audience and inspire them to take action. In addition to answering important questions, using images is another great way to enhance the quality of your content as the response rate increases by 40% if they see images in the content. At the initial stage, if you are having a strict marketing budget, you can take use of stock photos to keep the campaign running. Now that you have a primer to setting your goals and how to go about establishing the basics, here’s how you can measure the effectiveness of your inbound campaigns. While inbound marketing will work wonders for growing and expanding your business, it takes a lot of time and effort. You can improve your efficiency by tracking your results and dedicating your attention to the outlets that provide you with the best possible results. Tracking of the results is necessary to understand the progress of your campaign. It would help in driving success as you would come to know how your prospects are getting influenced by your efforts. You can use Google Analytics to learn what content is sending the most visitors to your website, but programs that track your links will also get the job done. When you see the difference that tracking your results and making small changes can have on your business, you will wish that you had started sooner. Enhanced profitability, increased web traffic and improved trust are what you can expect from a well-implemented inbound marketing strategy. When you use search engine optimization, social media marketing and engaging content, your audience will feel compelled to buy your products or services. Staying updated on the latest trends and being open to feedback will allow you to stay ahead of the competition, and you will know that your business is on the right path.